Explore a different artist, art style or theme each week. Camps include art instruction time, outdoor exploration, time for lunch, yoga, community volunteering, occasional field trips, and play. Each camp also includes tours of the historic neighborhood, led by Slabtown Tours. All camps are taught by professional artists and/or professional educators. 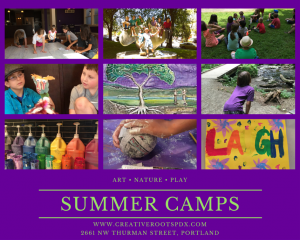 Camps are held at Creative Roots in NW Portland, at 2661 NW Thurman Street, unless noted otherwise. Mixed Media Camp, Ages 6-13 – School is out later than we had expected, due to all of the beautiful snow we had early in the year. 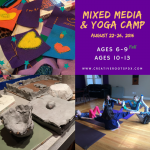 Creative Roots will host two days of camp with a fun and playful mixed media camp for mixed-ages. Campers will paint, work with clay, create paper mâché projects, work on fiber arts projects and more in a relaxing and child-led learning environment. 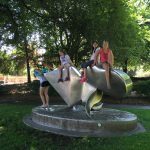 Campers will also have time for outdoor artwork and take small hikes each day in and around Forest Park. 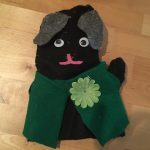 Puppetry I Camp, Ages 6-10 – Design and make your own puppets each day, write your own plays and perform them with your friends at the end of the week puppet showcase. During this camp we will design and make hand puppets including: sock puppets, finger puppets, shadow puppets, paper mâché puppets, and simple marionettes. 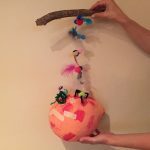 Puppetry II Camp, Ages 6-10 – During this week of camp we will make more complex hand puppets and marionettes. Design and make your own puppets each day using a variety of art materials, including paper mâché. 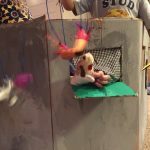 Write your own plays and perform them with your friends at the end of the week puppet showcase. Learn life-long leadership skills, including goal setting, perseverance, and communication skills while exploring your “Sparks”, what energizes you and keeps you working at your best. Explore your place in the world! We will explore communication, self-awareness and leadership in this camp through games, challenges, mindfulness and community service. Participants have an opportunity to work together to plan and implement their ideas to take action, engage in community service activities throughout the week, and make a difference. Pirates & Mermaids, Ages 6-10 – Explore the magical world of Pirates and Mermaids. We will design and create treasure maps, ships, looking glasses and explore sea creatures who might cross the paths of Pirates and Mermaids. This is a fun and creative camp for kids who are curious and inspired by the magic of the creative process. Sewing Camp, Ages 6-10 – Learn the basics of sewing. Make fragrant animal friends and simple sewing projects throughout the week. This camp has one spot available, please consider signing up for the sewing camp during week 7, or sign up for a spot on our waitlist. 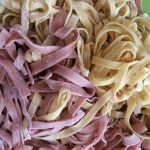 Cooking, Ages 6-10 – Learn basic food preparation and cooking techniques. Leave camp with a recipe book of healthy and delicious snacks to make at home for yourself and your family. This camp is currently Full, please consider signing up for the cooking camp during week 11, or sign up for a spot on our waitlist. Invent Portland, Grades 2-4, Creative Roots is joining with Saturday Academy to offer this new 1/2 day camp at PSU! Explore modern-day challenges in the city you live in and invent solutions to help. Gain hands-on experience bringing your ideas to life through everyday materials. Explore your imagination, creativity and the spirit of invention! 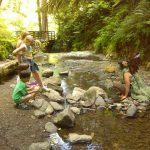 Enchanted Forest Hikes & Fairies Camp, Ages 6-10 – Campers enjoy a relaxing week of nature hikes, observations and fairy house building. 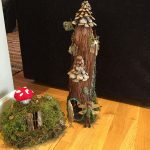 Make unique and creative fairy houses to attract fairies to NW Portland, and take home a fairy house to attract fairies to your home. 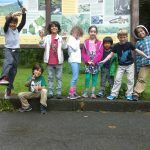 This camp has one spot available, please consider signing up for Enchanted Forest Hikes & Fairies camp during week 10! 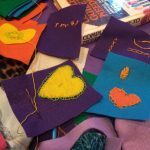 Sewing II, Ages 6-10 – A more advanced version of our Sewing Camp. 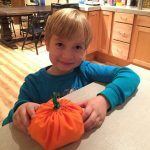 Make bags, toys, stuffed animals, pillows and design your own projects to sew throughout the week. Bubbles, Silly Putty and Slime, Ages 6-10 – Learn about the simple science of every day children’s toys and play materials. Each day campers will make one or two materials to use for countless hours of fun play time. 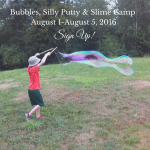 Make bubbles the size of a person, silly putty which actually copies print, slime, play doh and more! Guaranteed hours of playful fun. 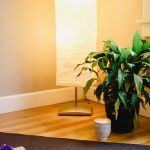 Mindfulness & Yoga Camp, Ages 10-13 – Develop a yoga and mindfulness practice infused with creativity. We will explore strategies for self-care, stress reduction and wellness practices which pre-teens and teens can take home. Activities will be both indoors and outdoors throughout the week. Fairy and Gnome Architecture, Grades 2-4, Is your Gnome part of a big family? Where does your Fairy live? Become a Fairy or Gnome as you imagine how these tiny creatures interact with their home. Go on nature walks to draw inspiration for materials to use in your home. Learn principles of architecture and perspective and design and build your tiny structure. Creative Roots is joining with Saturday Academy to offer this fun 1/2 day camp at PSU, 9:30am-12pm. Register on the Saturday Academy website. 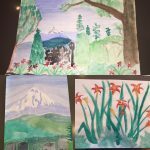 Roald Dahl: Imagination & Creation, Ages 6-10 – Outdoor adventures around NW Thurman include hikes and nature observations. 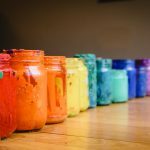 Campers will enjoy time painting, doing paper maché and creating art outdoors, learning about observation, drawing and painting techniques. 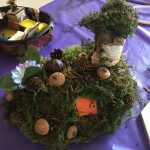 Campers will learn about Ronald Dahl, read some of his classic stories, and use some of his observation techniques to imagine and create creatures based on the natural world. Science & Art of Cooking, Ages 6-10 – Campers will learn about the science of cooking. Learn why yeast makes bread rise, how sparkling water gets carbonated, the effects of boiling water and freezing temperatures on different foods. 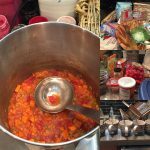 Campers will cook and assemble food, experimenting with the art and presentation of cooking. 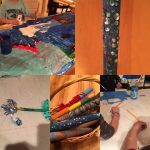 will be a fun and playful mixed media camp for mixed-age. Campers will paint, work with clay, create paper mâché projects, work on fiber arts projects and more in a relaxing and child-led learning environment. 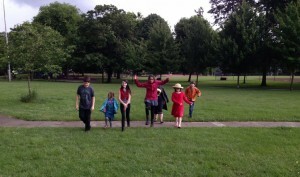 Campers will also have time for outdoor artwork and take small hikes each day in and around Forest Park.